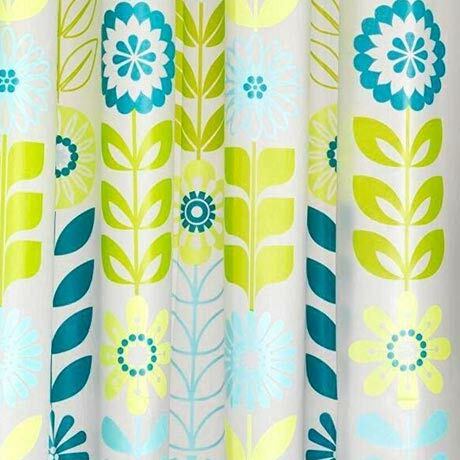 Croydex Mod Floral PEVA vinyl shower curtains are 100% waterproof. The sides and bottom are cut rather than sewn and eyelets are welded into the plastic. Because these shower curtains are made from plastic they should be wiped clean with a damp cloth and hung out to dry; they cannot be machine washed, dry cleaned, tumble dried or ironed. PEVA is a fully waterproof material that has a soft, "fabric like" texture. PEVA has to be Corona treated before it can be printed on making it one of the more expensive vinyl materials. Ready to hang with twelve tear resistant heavy duty eyelets. I do love the design if this item, really livens up my bathroom with a splash of colour!